Obituary for Mickie E. "Grannie" Cook | Jones Funeral Home, Inc.
Mickie Ellen “Grannie” McMackin Cook, age 94 of Crossett, AR, passed away on December 2, 2018 in her home. She was born on April 4, 1924 in Los Angeles, CA, to her parents, Harry and Myldred McMackin. She is preceded in death by her parents; infant brother, Harry McMackin; her husband, Jessie Harold Cook; one sister, Mimi Vandrew; one son, Gerald E. Fratt; one daughter, Angela Medina, and one grandson, Aaron Teague Hanson. While growing up during The Depression, Mrs. Cook played drums in the Monterey Park Drum and Bugle Corps, which her father organized and directed. She was employed as a “Rosie Riviter” in her early career for the U.S. Army. After the war, she worked a number of jobs in the cosmetic industry. Her hard work paid off as she eventually became a buyer for the cosmetic departments for Sages Complete Shopping in San Bernardino, CA, with six large stores. When Sage’s closed it’s doors, she was hired by Max Factor Cosmetics and traveled all over the United States and Paris, France. In 1973, she and her husband, Harold, purchased a camera store in Lancaster, CA, where they worked until retirement in 1990. They began a joint effort to make over 100 porcelain dolls. They poured, fired, and sanded the greenware and assembled the dolls. Mrs. Cook painted their faces and made their clothing. From California, they moved to Springfield, MO, until Harold’s passing in 2001. From Springfield, she moved with her daughter, Julie and husband, Gary, to Crossett, AR. Grannie was a member of First United Methodist Church of Crossett, AR. She is remembered for her lovely cards that she sent to friends and family. In each card, she lovingly placed a pansy flower that she had grown and pressed. She joined the knitting group in the church, helping to provide Prayer Shawls for those in need. This group of ladies became her beloved extended family. She was also mascot for H&R Block. 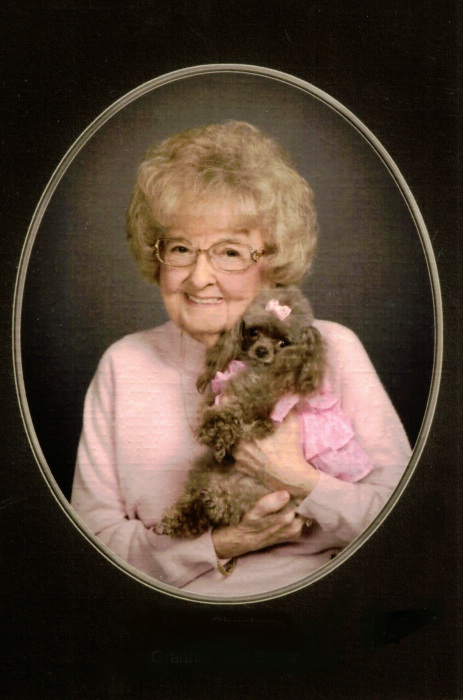 Her little teacup poodle, Sugar, could always be found by her side while she knitted. She is survived by two daughters, Julie Johnson (Gary) and Melissa Allen; one daughter-in-law, Lora Fratt; a special friend, Joyce Fratt; ten grandchildren, Misty Goodwin (Matt), Doug Fratt (Camille), Laurie Fratt, Kenny Fratt (Chrissy), Monica Pettigrew (James), Amanda Pytlak (Greg), Jessica Reinhardt (Kyle), Sara Stanford, Kristi Baker and Brad Arnett; one niece, Glenda Walsh (Rob); fourteen great-grandchildren; two great-great grandchildren and three great nephews. Funeral Services will be held under the direction of Jones Funeral Home, Inc. at 11:00am on Wednesday, December 5, 2018 at First United Methodist Church of Crossett with Dr. Bryan Diffee officiating. Pallbearers are Gary Johnson, Matt Goodwin, Sr., Jordan Eyman, Matt Goodwin, Jr., Nick Goodwin and Doug Fratt. Visitation will be held from 10:00am until 11:00am at the church prior to the service. Family graveside services will follow the next day at Delaware Cemetery in Nixa, MO. Memorials may be made to the First United Methodist Church, 500 Main Street, Crossett, AR 71635.